We were enjoying a balmy 50 degree winter here (with even a couple of 60 degree days) this December. That is not normal here in Utah. We are usually knee deep in our fine, powdery snow. But we were not complaining. I even spray painted outside…with bare feet a couple of weeks ago. That NEVER happens in December. Then we woke up to snow on Christmas Morning and ended up with about 10 inches by the time it stopped snowing. And then it got cold…FREEZING cold. 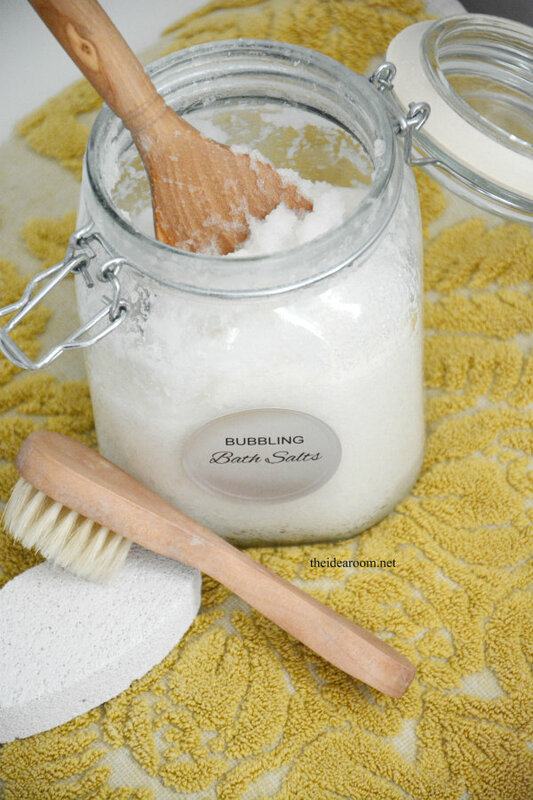 So I made some Bubbling Bath Salts…and, well…it almost makes the cold weather worth it! Now, if you have been following along, you know I like my Bath Salts. 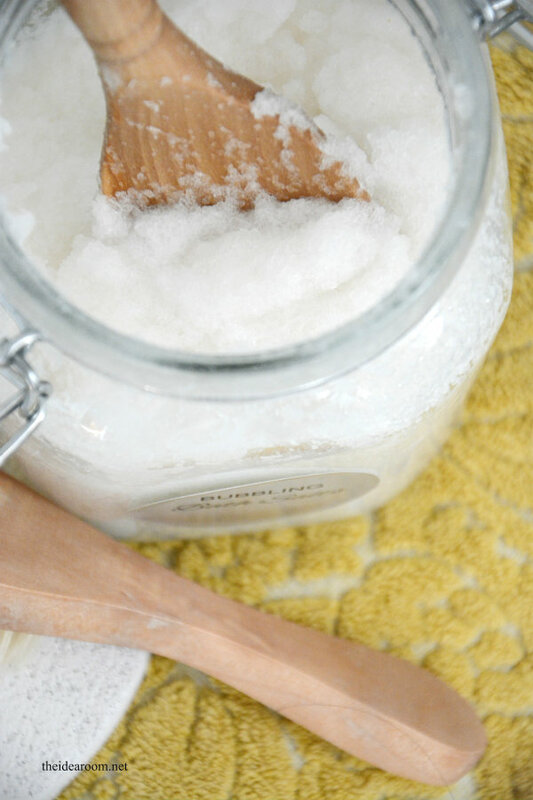 I have shared some of my Bath Salt Recipes with you here in the past. 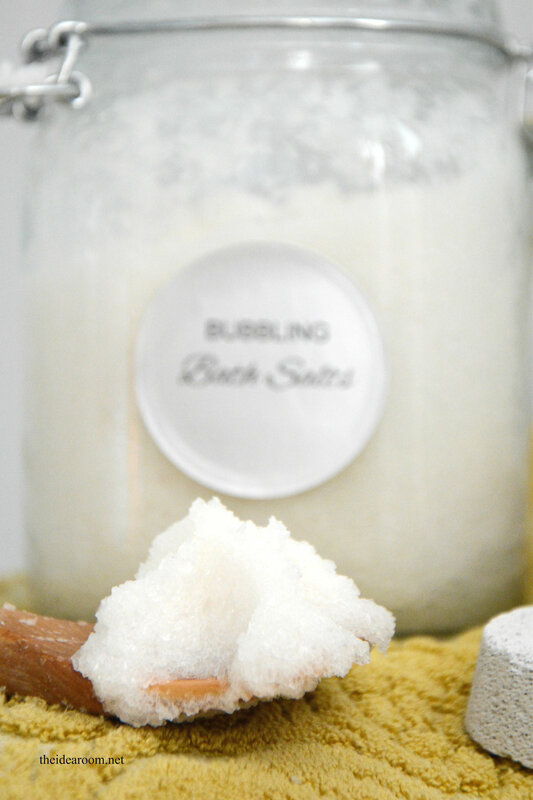 But this time I wanted to experiment and make a fancier version of the Bath Salts. 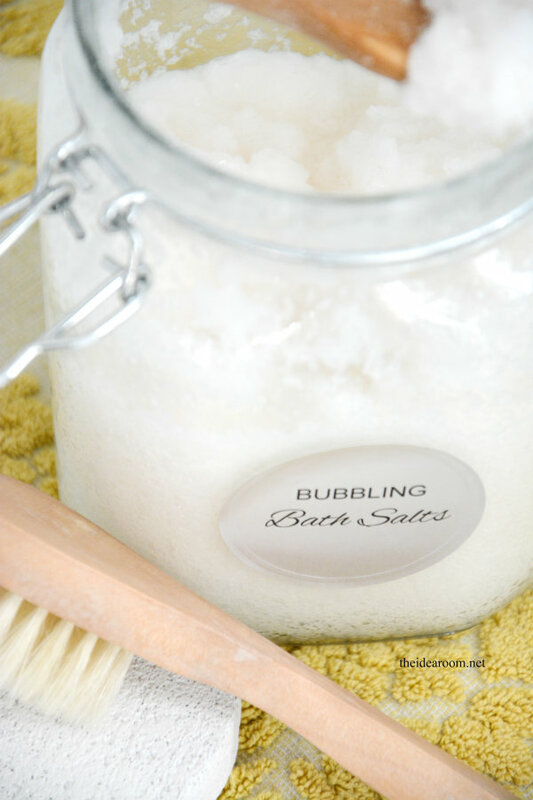 I really like how these Bubbling Bath Salts turned out. These are so simple to make but seem really fun and fancy. 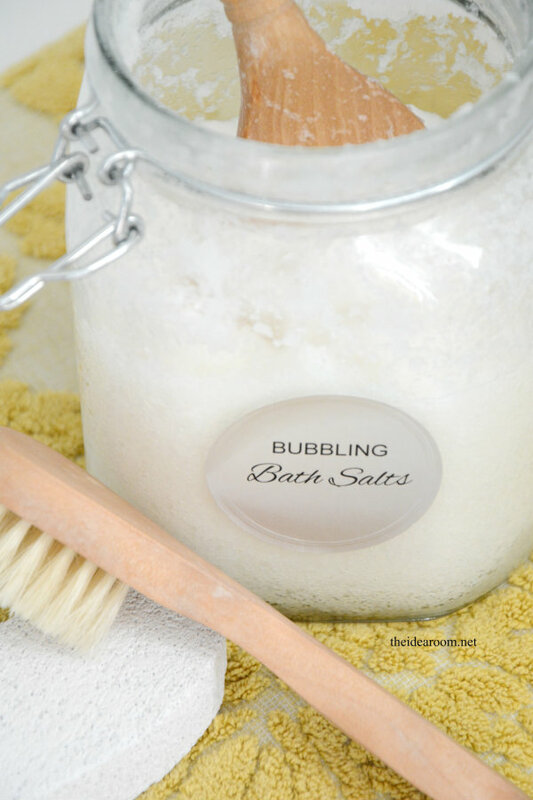 My girls have been begging to take baths everyday since we made this…and in this cold weather…it is the perfect way to warm up! The first batch we made, I added doTERRA’s essential oils Eucalyptus and Lavender, because the girls and I were sick. It was so soothing to breathe in these scents while relaxing in a hot bath. 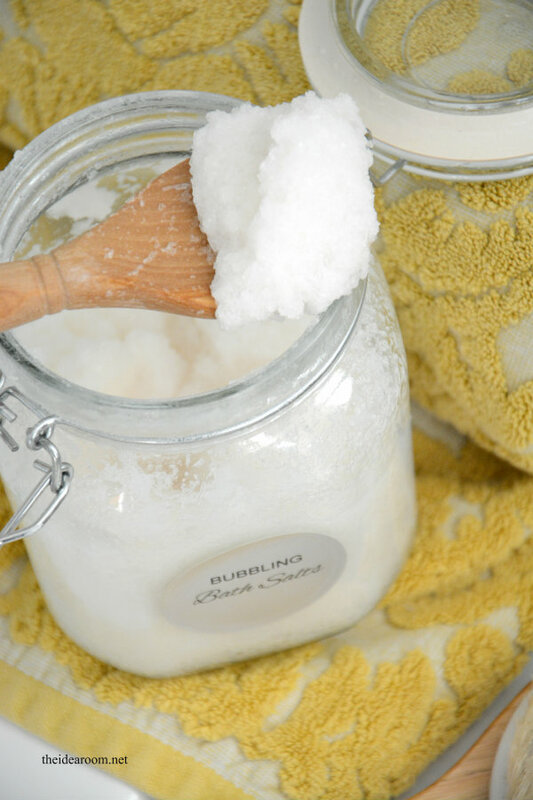 The nice thing is that you can totally customize them for the type of bath you want to take…Lavender before bed to relax, Citrus in the morning or afternoon to energize and reinvigorate your mind and body, or Eucalyptus if you are feeling under the weather. 1. Mix all ingredients together and combine well in a large bowl. 2. Transfer into a clean, air-tight container. 3. 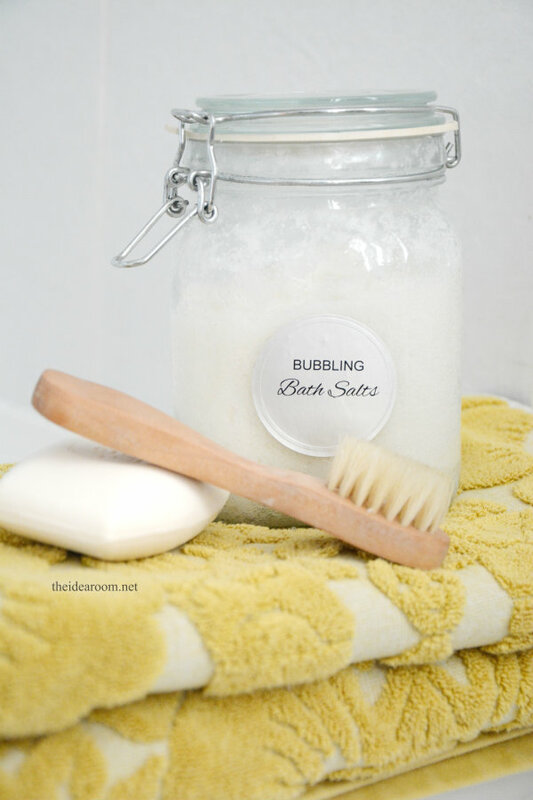 Add a small scoop or two to your running bathwater by placing the salts under the running water, to activate the bubbles. 4. May last up to 3 months if kept in a clean, air-tight container. Do not scoop with dirty hands or fingers. 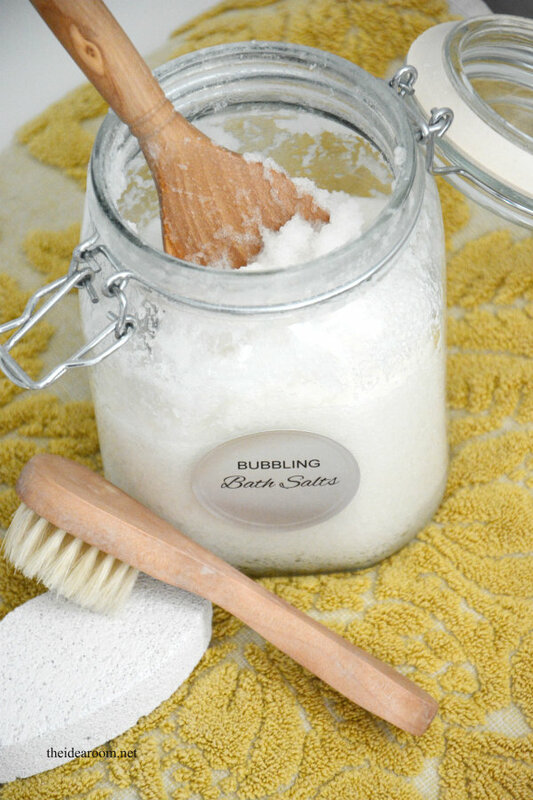 *Click here for a printable Bubbling Bath Salts Recipe. 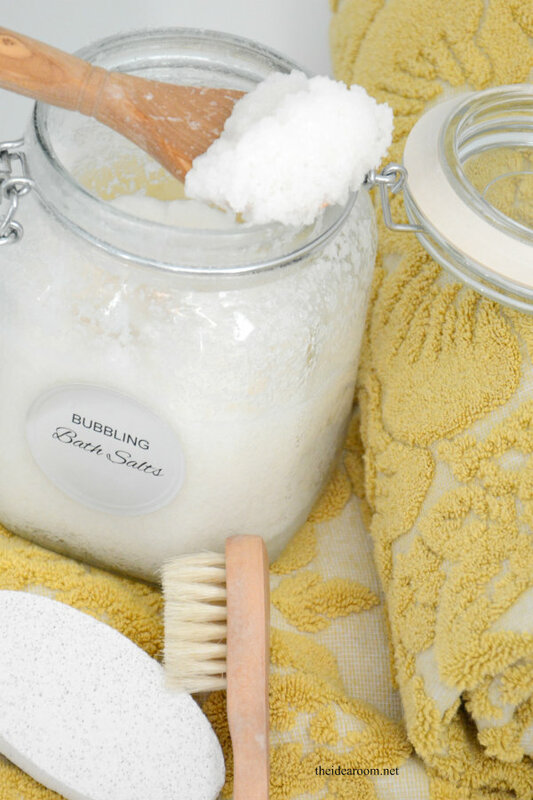 These Bubbling Bath Salts creates some bubbles and the salts provide some great minerals to soothe your skin, remove impurities and detoxify your body. 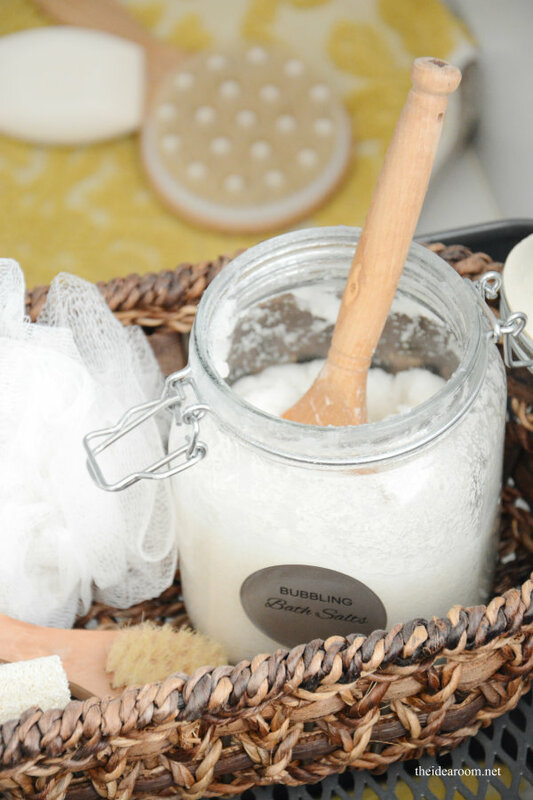 The warm bath water helps to open up the pores on your skin which also aid in the detoxification process…and depending on the essential oils you add, you also get the benefits of the different oils. I found this great chart from Lindsey, who shared this on Hello Natural, when I was looking for different essential oil combinations and am excited to make this again depending on the type of bath we are needing. These are perfect for nice DIY gifts too! Make some for your friends for Valentine’s Day…or a special night in for you and your significant other. 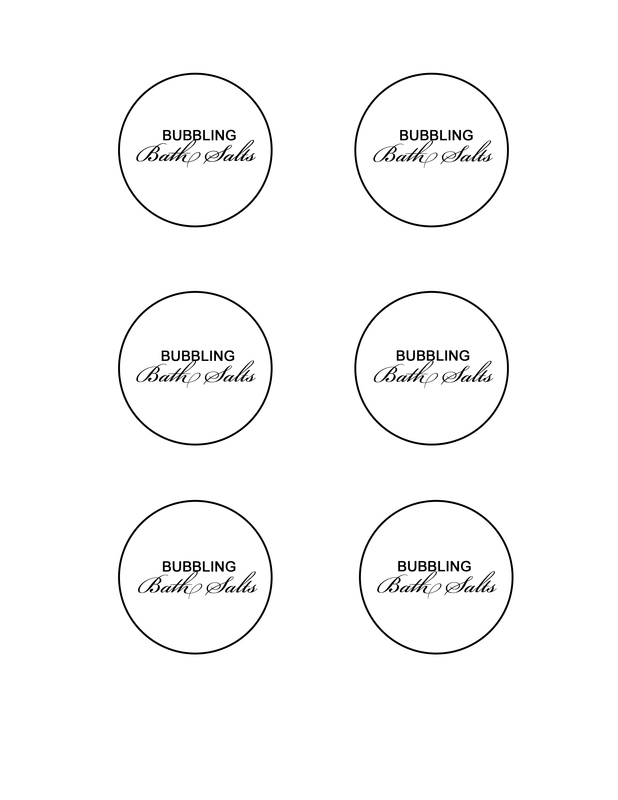 Add a special label to it with these printable labels. 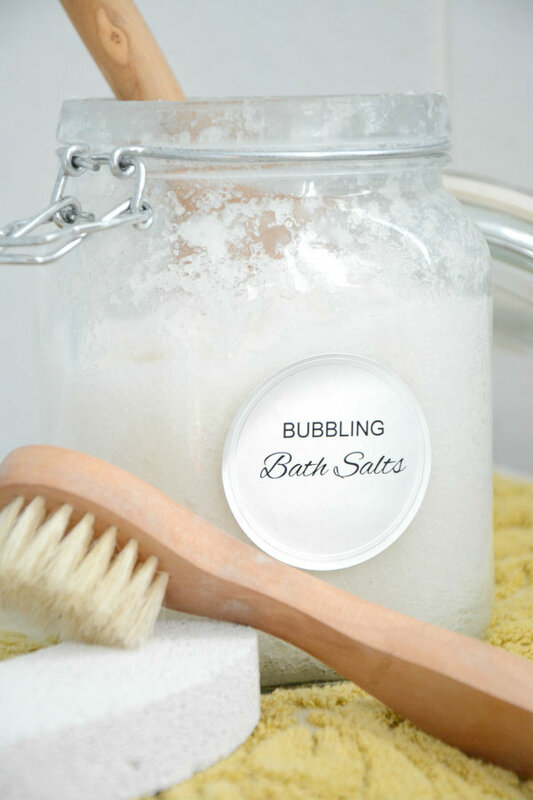 For these Bubbling Bath Salts I used these Embossed Silver Foil Labels from Avery. 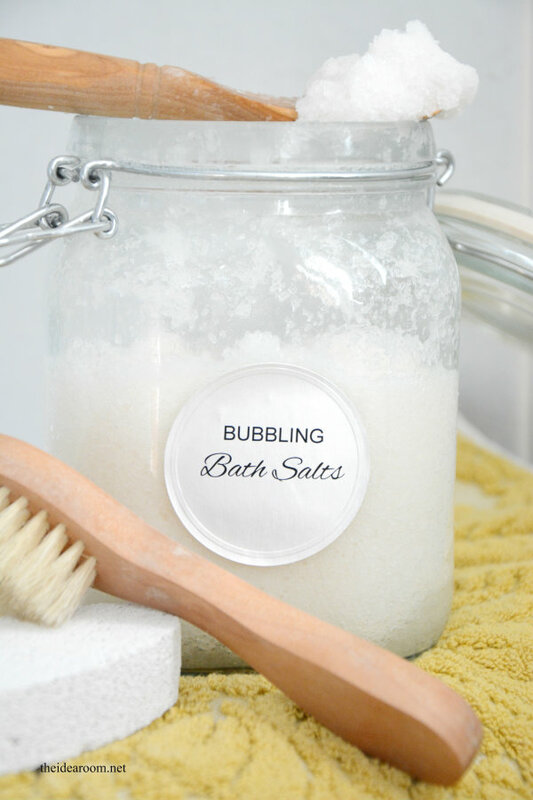 So easy to fill in the template and then print them out onto the labels…and I like how fancy they make the Bath Salts look…like you paid a lot of money for them from a high end spa! 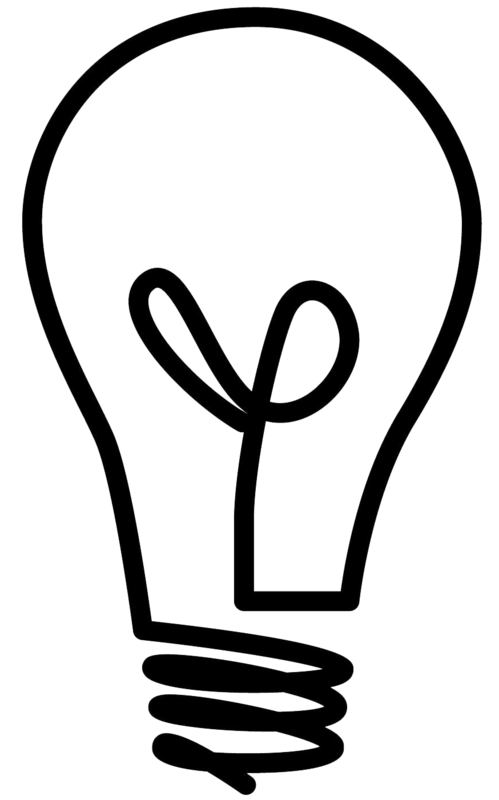 Make your own labels, or download these labels on your own paper. I don’t normally use the Avery labels. I usually just print out my handmade labels on some regular computer paper and then glue them onto the jar using a simple Elmer’s glue stick. I find it works so well and the label lays down nice and flat just like a sticker, but is so inexpensive. 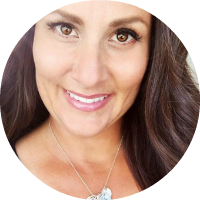 Click here for printable 2 inch labels to print on your favorite paper. These sound wonderful. I can’t wait to make my own batch. Wow that is so cool can’t wait to make mine! 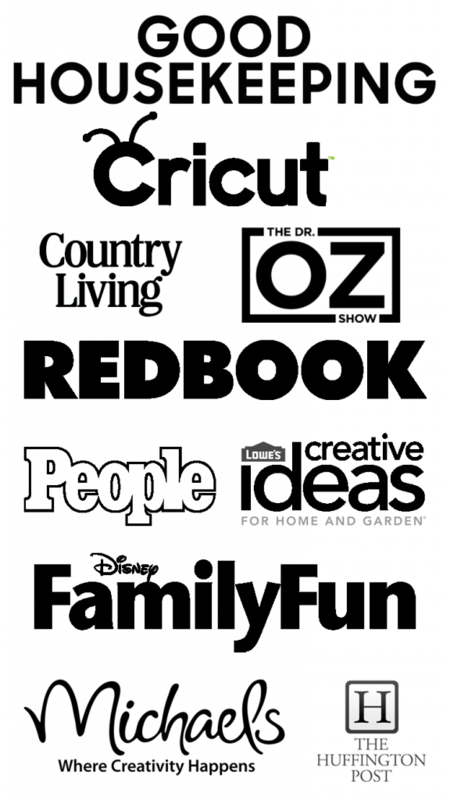 I live in Melbourne Australia & have just found your site, it’s fantastic! 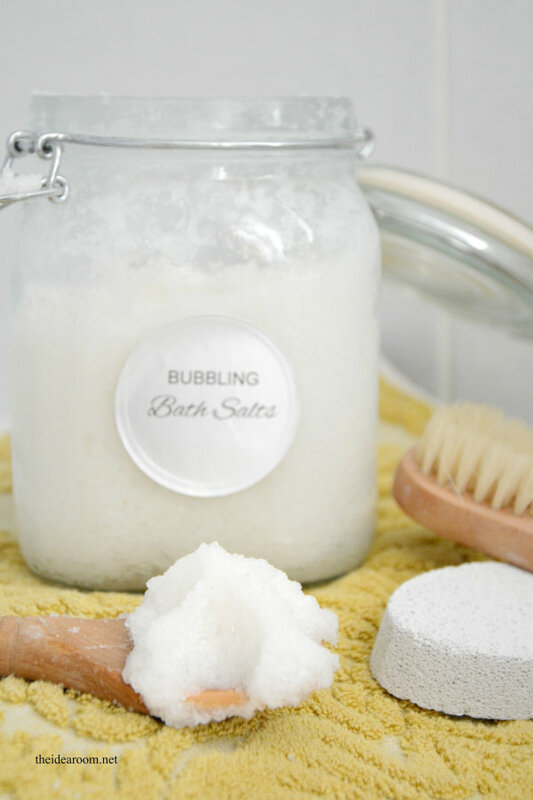 My daughter is turning 10 in a few weeks, she is having a pamper spa & sleep over party, as party favors this year we are making goats milk soap & we are also going to make these beautiful Bubbly Bath Salts instead of lollies. Can’t wait to see what other delights you come up with. These sound wonderful! The different aromatherapy blends sound awesome! Thank you for this great project!! I’ve never heard of using any salt other than Epsom salt. Is there a reason for the rock salt or kosher salt? Thanks for the info and idea. this sounds like a neat recipe. i haven’t heard of the rock salt either. I am a registered aromatherapist and I would strongly recommend not using clove oil for bath salts as recommended in the one image. Clove oil can irritate skin very easily and could cause a rash. Also, in the blend that contains sage – I would switch to Clary Sage instead as it is in fact more balancing. Sage is a nervous stimulant and can cause heart palpitations. It also contains camphor which should be avoided during pregnancy. All of the blends need to be carefully used around children as well as children under 10 should avoid some of the oils listed. do you mean sea salt instead of rock salt? we use rock salt to melt the ice on the sidewalk. What can I substitute if I don’t have rock salt? Rock Salt is the best but maybe Epsom Salt or Kosher Salt might work. Can you tell me why rock salt?? Barbara- I just like the size of the rock salt and it takes longer to dissolve. Hope this helps. Thanks. Castile soap would work instead of body wash, right? Courtney- Castille body wash should work. It just needs to be liquid. Hope this helps. Do you have to crush the rock salt? It seems when I have seen it in the past, it has pretty large granules. AJC- I don’t crush the rock salt. Just make sure it is Rock Salt for making Ice Cream.